Nanetya is young Maasai Girl, who lives in a small village on the boundary of Maasai-Mara National reserve in Kenya. She is cheerful, clever and Intelligent, and spends most of her time at my home, which located at the same village. Since her early childhood, Nanetya is playing at my house. Sometimes I wished I could tell her stories, the same way my parents told me, like parents all over the world tell their children. Soon enough I realized that I am facing not one problem but two. First that Massai parents who know to read and write – do not remember any traditional stories. On the other hand, there are NO CHILDREN BOOKS in Massai language at all. Therefor, the only stories I could read Nanetya, should be in English (the Official Language of Kenya) or KiSwahili (the Linga-Franca of Kenya) – both languages she does not know. I found a solution. Together with some youth in the village, we wrote two short story books in MAA (Massai language). I illustrated them and printed one copy – for Nanetya. 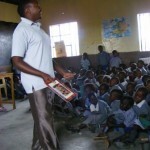 These were the first children books in MAA language the children had ever seen! I sat under the shade of the large tree in the middle of the village with the books in my hand. A young boy that just returned from school took one of them from me and started reading.. Suddenly, like magic.. more and more people surrounded him – young children, teenagers, and Elders. All of them loudly participating in the story. The boy was reading and they understood! The books passed from hand to hand – everyone excitingly commenting on the story and reviewing the illustrations. Then it struck me. It came to my mind that the problem is not about Nanetya alone. It is a global issue involving many Ethnic groups that their language was never written before. Nanetya – Foundation was created at that very moment, to give a solution children all around the world. 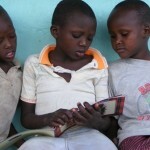 To be able to read books in their own mother tongue.